Located in the heart of Lincoln Park the non-smoking Hotel Lincoln offers high-tech amenities like HDTVs and iPod docking stations in a northside Chicago location that was once Al Capone's home. The 12-story Hotel Lincoln has 184 non-smoking rooms including many that offer sweeping views of Chicago's Lincoln Park and Lake Michigan. 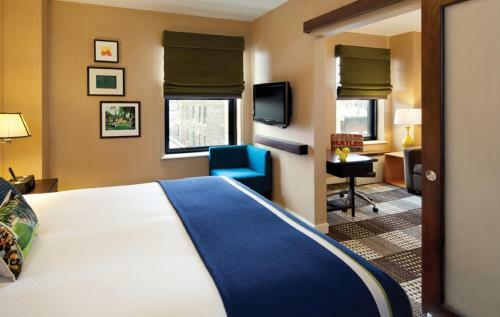 All the rooms have free Wi-Fi flat-panel 37-inch HDTVs bedside stereos with iPod/iPad docking stations and bathrooms stocked with high-end bath products and hairdryers. Throughout the hotel enjoy original art from local artists. The hotel provides a fitness center bike rentals rooftop yoga classes in the summer and staff-led trail runs through the park. An upscale restaurant is on the first floor. Use the on-site business center to catch up on email or print boarding passes. Valet and self parking are available both for a fee. Hotel Lincoln is on Chicago's North Side across the street from Lincoln Park and less than three miles from Wrigley Field. Spend the afternoon at Lincoln Park Zoo take a stroll along the shores of Lake Michigan. The Chicago History Museum is a five-minute walk away. Shopping at Water Tower Place along the Magnificent Mile is less than two miles away. Soldier Field home of the NFL's Chicago Bears is five miles south. The bus stop one block away at Clark and Wisconsin makes it easy to get anywhere in the city. O'Hare International Airport is 18 miles away and Midway International Airport is 12 miles away.